This is a new printing of the original edition on sturdy, acid-free paper. 12 pages. All markings are original. We include a capsule biography. Highest quality guaranteed. Size of music is 10.5" x 13.5". $10.00. Charles Augustus Garratt (1844-1938), was born in England and moved to Canada and then the United States and ultimately died in Knoxville, Tennessee. He taught violin and directed a high school orchestra. As to the hyperbolic title of “Grand Triumphal,” there is only mystery. It was published in St Louis, Missouri, at the same time as his “Grand Triumphal Festival March” for piano (with an unusual landscape title page that intertwines the titles of the two pieces). 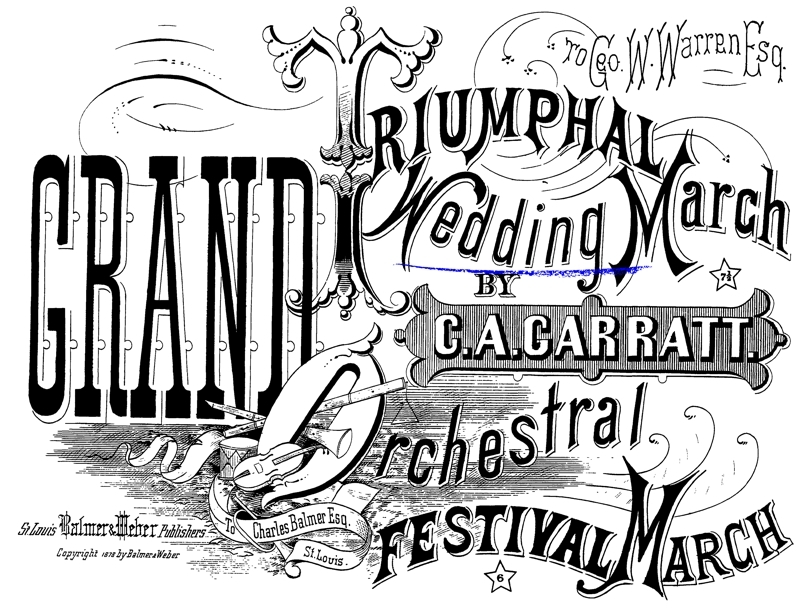 And yes, you may simply leave out the word wedding and call it “Grand Triumphal March” when you play it! Moderate.